Egglo Entertainment (http://EggloEntertainment.com/) has introduced a new product to help children understand the meaning of Easter. The suite of products has positioned itself to take advantage of a child’s fascination with all things that glow to teach the Easter message that Jesus is the Light of the world. Glow in the Dark Egglo Eggs ($9.99) –this is a dozen plastic pastel Easter eggs. They come apart into to pieces so you can put treats in them. I found the plastic eggs to be a bit more durable than plastic eggs we’ve purchased in the past few years. They open in half the length of the eggs, and since the two sides are not attached, Levi enjoyed putting them together in various color combinations. The Egg-cellent Easter Adventure book ($9.99) – This 40-page soft cover book is the story of three cousins who find a glowing Easter egg in the attic. The egg contains a scroll message that leads them on a trail to find more clues to learn that Jesus is the focus and reason for Easter. The children travel to exotic locales as the eggs transport them from the bottom of the ocean, Egyptian pyramids, and Easter Island. The Egg-cellent Easter Adventure (audio book download, $2.99) – This is an audio recording of the entire book The Egg-cellent Easter Adventure noted above. It lasts approximately 30 minutes. The reader’s voice is pleasant, and he reads at a conversational pace to keep children interested. 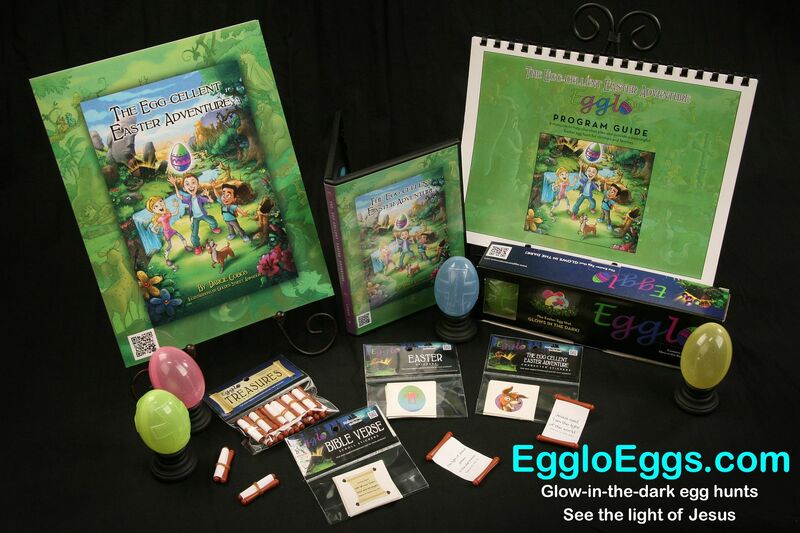 The Egg-cellent Easter Adventure Program Guide (download, $14.99) – This is a 62-page book that gives churches ideas on creating a family-friend event using the Glow in the Dark Egglo Eggs as an Easter egg hunt. If your church or neighborhood is interested in hosting an evening Easter event using the eggs, than this might be of some help to you. They have some unique, themed ideas for snacks. They also have some object-lesson teachings to introduce the idea that Jesus is the Light. However, the bulk of the book (43 pages) are reproducible invitations, coloring pages, and posters. Another item that some reviewers received was the Egglo Treasures Scripture Scrolls ($4.29). These were not in my package from the company, but I did want to mention them. Honestly, we’ve had a hard time getting the eggs to really charge. Sunlight (free and easy!) had been our first choice, but our efforts have not produced much phosphorescent glow. I will have to try sunlight again in the spring, when we can set the eggs out on the lawn & the sun is stronger; perhaps the tinting and gas in the double pane windows was preventing a good charge. We don’t have a decent black light, so that was out. My last option was using the compact florescent (CFL) bulbs we have in our lights. I was pretty happy! But you’ll notice that I really had to get the light close to the eggs. Any other time I tried to charge the eggs with just a standard ceiling light height, the charge was faint and did not last for more than about 15 minutes. This charge definitely lasted for about an hour at this intensity. Levi and I cuddled up one wintery afternoon to read the book The Egg-cellent Easter Adventure story book. At a basic level, the story is a scavenger hunt for three children (and dog Zeke) to find the real meaning of Easter. Bible verses are sprinkled throughout as the children are magically transported across space and time to exotic locales. In the end, the children learn that the greatest gift of Easter is Jesus, the true light of the world. This makes their nighttime Easter egg hunt with glowing eggs even more special. I have mixed feelings about the book. While I thought the theme and message of the story is worthy, I was disappointed by the illustrations, which are cartoony. I personally prefer it when publishers are able to acquire hand drawn illustrations compared with computer animated art. Secondly, I could tell that Levi was not fully engaged in the story. I’m not sure if he felt too old for the story or if the storyline felt too forced; regardless of the reason, the story felt a bit too long and drawn out for the message, in my opinion, and he has asked me not to read it to him again. Luke showed up for this object lesson – who doesn’t like a fort and flashlight (the boys even asked if we could keep it up until Friday night so they could sleep in it!). My recommendations & thoughts: The boys and I like the idea of celebrating Easter with glow-in-the-dark eggs. Having this product has challenged us to think about Easter in a new way – I mean, who does an egg hunt at night?! But to communicate the importance and central point of Easter, the Egglo Eggs are really a fantastic teaching tool. I appreciate the The Egg-cellent Easter Adventure and think that it could be used effectively with children; I know my kids did not quite click with it, but then again maybe it was the time of year. I’ll pull it out again as we get closer to Easter. I do plan on passing information about the program and Egglo Entertainment Glow in the Dark Eggs to the party planning people at my church. It would be a great twist on our traditional Easter celebrations and I know the kids would really love a low-light hunt with flashlights and glow in the dark eggs.